Choosing a perfectly right fit coffee making and espresso machine is not so easy, when you have enormous models and types present in the market. 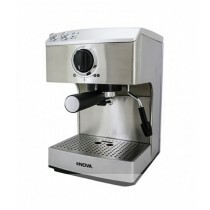 Having espresso machine at home saves your money from buying such beverages from outside and plus is that you can enjoy gourmet coffee at home. You can see many reviews on coffee makers that may serve as buying guide for you. Thermal Coffee Makers: these coffee makers use thermal carafe to replace glass chamber thus temperature of brewed coffee can be kept in proper range by eluding overheating. Single Cup Coffee Makers: these have stainless steel water tank, helps in preparing a single cup delicious cup very fast. If you are in pursue of flavor brilliance and can bear higher price, then espresso is the perfect choice for you. It is also best for blending cappuccino and lattes. These espresso machines can also make normal coffee. According to functions espresso machines could be classified into four kinds; Manual espresso machine, Semiautomatic, Automatic and Super-automatic espresso machines. All are best on their functions. iShopping.pk is a quickly spreading brand about online shopping in Pakistan that only deals in genuine brand name products from all around the world. As far as coffee machines are concerned we have lot of brands namely Philips, Nova, West Point, Anex, Panasonic, Bosch and many more. We are presenting it all at lowest prices in Pakistan. Just go through our showcased page of categories, you will see huge number of selections for your choice. On other side feel confidence to talk with us for any query or question. Our dedicated representatives are here to serve you with excellence and help you getting the best of your interest.